I mentioned early on that my machine runs in a dual-boot mode, with Ubuntu 10.04 as my main operating system, and Windows Vista on a separate disk partition for occasional use when I have to run a Windows’ application. Wouldn’t it be nice to break free from Redmond altogether and run everything under Linux? Well, once again, this is one of my long-term goals, but one that may not necessarily be realized. The quick-and-dirty solution is to use a Linux program that is equivalent to a given Windows’ application. For example, the Evolution mailer is pretty close in terms of functionality to Microsoft Outlook and, similarly, the many features of OpenOffice (e.g. Writer, Calc and Impress) are more or less equivalent to those available in Microsoft Office (Word, Excel and PowerPoint). But, Linux packages are not always 100% compatible with their Microsoft counterparts and, while this might not be a problem for those who use such software in a stand-alone environment, incompatibilities can be deal breakers. For example, I need to exchange spreadsheet files with colleagues but, when they send me a .xlsx file which includes charts, I can open the file, and see the underlying data tables, but the actual charts are not displayed correctly. So, I have to run a real copy of Excel under Windows in order to view the material. Or, do I? In fact, there are ways to run Windows’ programs inside Ubuntu. Two possibilities come to mind: (1) Wine (that’s the “non-emulator” software, not the red and white stuff), and (2) using a virtual machine with a package such as Virtualbox. We are going to look at both options, and today’s task is to load Wine in order to see if a favourite Windows’ program will play nicely under Linux. For those of you who missed the “non-emulator” reference, WINE is one of those recursive acronyms that Linux developers seem to love (think GNU’s Not Unix) and stands for Wine Is Not an Emulator. Quite frankly, the nuance escapes me, but the bottom line is that installing Wine allows you to run Windows’ programs without Windows. 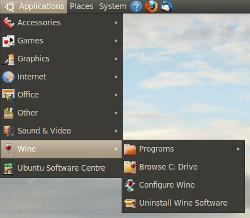 Wine appears on the list of programs available in Ubuntu 10.04’s Software Centre; however, it doesn’t seem possible to install it this way. Searching for Wine, and clicking on the Install button, seems to start the download process but then a dialogue pops up saying “Requires installation of untrusted packages”. Clicking on OK (sounds good to me; I have installed Wine on previous version of Ubuntu with no problems) just seems to cause the installation to quit. Nothing further happens. The Programs tab contains the software that is installed and ready for use. Wine comes with a version of Notepad by default (hence the drop-down arrow on the menu). The tab marked Browse C: Drive may not be what you think. This isn’t a real Windows C: drive (even on a dual-boot system); it is actually a pseudo-drive that forms part of the Wine installation and is where the applications will be stored once installed. You will also note that there is a tab to Uninstall Wine Software, but nothing to indicate how to install programs under Wine. So, how do we stock our Wine cellar? Well, that’s the next task. This entry was posted in Windows, Wine. Bookmark the permalink.